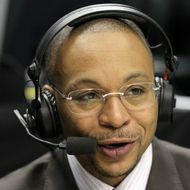 We were watching our beloved Illini lose (again) to the Indiana Hoosiers on the Big Ten Network last night, and we were reminded once again that, for the first time in sixteen years, Gus Johnson will not be calling NCAA Tournament games. Johnson's enthusiasm and unparalleled vigor have become synonymous with the tournament, and his excited squawks and warbles have become the tourney's unofficial soundtrack in our overcaffeinated, "Best. Announcer. EVAH!" age. But watching Johnson last night was a reminder of the truth about Johnson, one that gets lost in all the foofaraw of the Gus Johnson Soundboard: As a basic play-by-play announcer, he's really quite awful. We do not mean that it is not exciting to listen to Johnson at times, from "Rise and fire!" to even his offensive-but-at-least-creative "He's got get-away-from-the-cops speed." And we'll confess, we'll always love the deranged lunacy of his UCLA-Gonzaga call in 2006. And his odd, almost-restraint (for him) on the radio call of Allan Houston's famous last-second shot in 1999. But that's sort of the problem. That genuine excitement has become canned and processed since Johnson has become more well known — and Internet-beloved — for his shtick. Frankly, we don't believe Gus anymore. He has gotten more and more screamy, a celebrity gimmick artist, and less of a person who, you know, tells you what's going on in the game. He loses track of what's going on, he misses obvious points, and he's rather obviously just waiting for the next moment to scream, the next moment to take his moment in the spotlight. The most famous example of this is last year, when Johnson got so caught up in Awaiting a Gus Johnson Moment, he stopped paying attention to the score altogether. Last night, it was plain and clear that Gus hadn't done a lick of research on either Illinois or Indiana. He consistently got players' names wrong, lost track of the score, and kept saying Illinois was switching into a zone even though coach Bruce Weber (much to the annoyance of Illini fans) infamously refuses to play a zone. Johnson also appears to know nothing of the Big Ten race or even what each team's records were; he talked about each team being obvious NCAA tournament teams going in — it must pain him to even say the words "NCAA Tournament," so anguished he is that his precious has been taken away from him — when that was far from the truth. And he works for the Big Ten Network. He actually saves most of his energy to say the name of various sponsors throughout the game; that, if anything, is all he can say with much authority anymore. He is, essentially, a hired gun of hot air, sort of the Jeff George of broadcasting. Watching a Gus Johnson game anymore is like taking whippets: There's an immediate, quick high, but it's gone instantly and all you've done is kill a bunch of brain cells really fast. Gus Johnson worked for the NCAA Tournament because no one knows those teams very well anyway, and it's an event watched mostly by casual fans, watching their first college basketball games of the year. They want the artificial sweeteners, because otherwise, it's just one team from Louisiana playing another team from Oregon. But that doesn't work outside the tournament. These days: It's all about Gus, and only about Gus. Oh, and honestly: He's the worst Madden announcer imaginable. Bring back Summerall. "Boniol ... ready to kick."